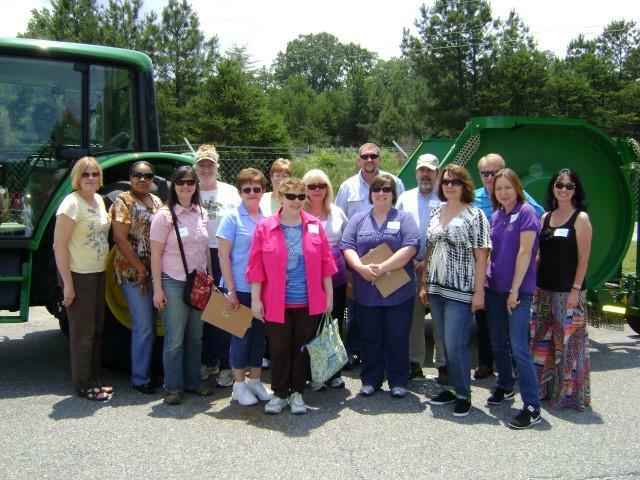 Vocational Rehabilitation counselors from all over the state converged on Athens, Georgia to be farmers for a day. Through this interactive workshop, the counselors learned about farm culture, farm equipment, assistive technology, and VR policy related to farmers returning to work. The workshops are part of a new partnership between VR and the University of Georgia's AgrAbility project. 100% of the participants gave the overall workshop the highest rating possible. Participant comments on the strengths on the session included:interactive, direct application to VR policies and procedures; trainers were excellent and engaging; great handouts and videos; very knowledgeable presenters. Several VR staff were so excited after the workshop that they wanted to volunteer on their day off at a local farm. A volunteer day was organized at Ms. Ruby Davis' farm where the counselors rolled up their sleeves to help her with a variety of tasks around the farm. The AgrAbility in Georgia bi-annual board meeting was held in May with guest speaker Jack Coan from Mobility SVM. Mobility SVM accessible trucks are full size trucks that allow drivers with disabilities experience the independence of traveling comfortably. You can find out more about Mobility SVM by going to their website at www.mobilitysvm.com. Georgia AgrAbility also welcomed several new board members including: Richard Stanley, Georgia farmer and AgrAbility client; and Vanessa Jones, director of the Farmworker Health Clinic project.